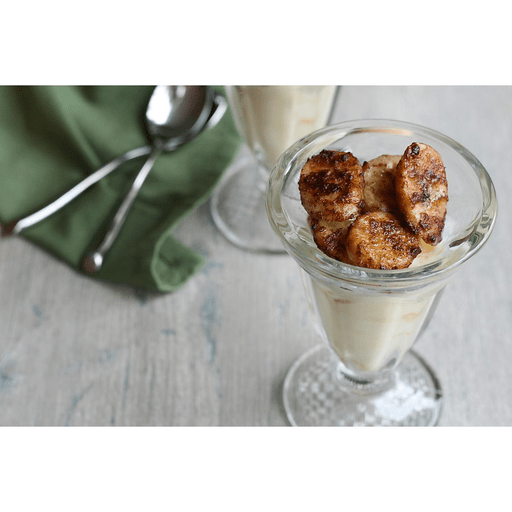 These delicious Sweet Caramel Cinnamon Baked Bananas have just the perfect amount of sweetness. We love them plain or on top of oatmeal, yogurt, pancakes or even ice cream! 1. Preheat the oven to 350°F. Line a large baking sheet with parchment paper and set aside. 1. Peel bananas and cut into ¼-inch thick rounds. Place cut bananas into a large bowl and drizzle with melted coconut oil. Sprinkle with coconut sugar, ground cinnamon and sea salt and gently stir to combine. 1. Spread bananas in a single layer on the prepared baking sheet. Bake in preheated oven for 15 minutes. Flip the bananas over and bake for an additional 10 minutes. 1. Remove from oven and let cool slightly before serving. Serve plain or on top of oatmeal, yogurt, pancakes or ice cream. Calories 200, Total Fat 8g (Saturated 6g, Trans 0g), Cholesterol 0mg, Sodium 150mg, Total Carbohydrate 35g (Dietary Fiber 1g, Total Sugars 4g, Includes 4g Added Sugars), Protein 1g, Vitamin D 0%, Calcium 4%, Iron 6%, Potassium 2% *Nutritional values are an approximation. Actual nutritional values may vary due to preparation techniques, variations related to suppliers, regional and seasonal differences, or rounding.